The photographs of the atlas can be purchased as a fineart print. In recent years, the importance of fascia has been greatly rediscovered. benefit of comprehending and retaining knowledge of the connective fascial network. They accentuate that a greater emphasis be placed on fascia and its functions during teaching and training. paramedical personnel have validated that fasciae greatly influence the human body in various ways. Research has underlined the aforementioned fact. This book is intended as an aid for practitioners and aimed at anatomically skilled readers. It presents detailed dissections of fascial systems using soft, life-like fixed tissue. properties of fasciae to the readers. and teaching, resulted in presentations of the fascial systems, illustrating the anatomical relations at first glance. component of fascia, the collagens, has been vividly stained. and has been enlisted by the Institute of Anatomy Leipzig for capturing the images in this book. The impeccable layout adequately compliments the rationale of the presented “Atlas of Human Fascial Topography”. 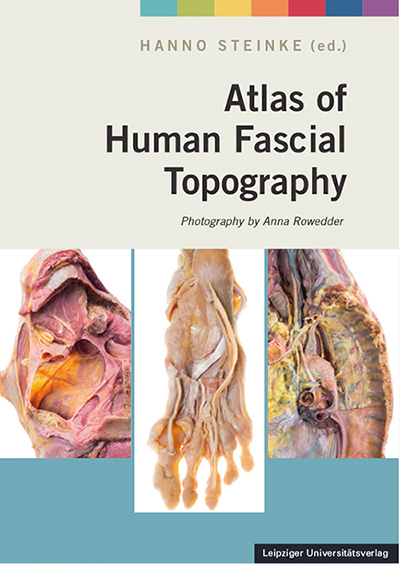 This atlas will intersect the anatomy of fasciae with the known academic topographic anatomy.